Some jokingly call this part of Tuscany Chianti-shire and for good reason. For the past century, visitors came to visit and decided to stay. It is easy to understand why. This is a region with great climate, the finest wines and olive oils plus glorious panoramas. 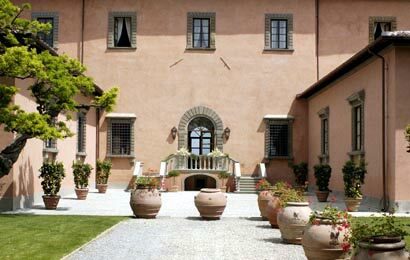 You have your own wine tasting experience, lunch in a Tuscan Trattoria and tour of the private homes of the country folk. The Lecture-Guide-Driver explains the simple, yet precise lifestyle of this region and how the inhabitants nurse their agriculture with a religious fervor. You fully understand (in fact, you have a belly full) after sampling the fare. We only hope you don't forget to jot down the recipes and arrange to ship the ingredients home.That won't be necessary, of course, if you decide to stay. This tour can be extended to include a private cooking class. We contact your host-teacher the day before your visit so she can purchase the ingredients for the dishes you select to prepare. The next day, at the end of your lecture-tour, you arrive, prepare the chosen dishes and, of course, enjoy the dinner-fruits of your labor in the pastoral setting that is your teacher's home. Please add Euro 190 per person participating. Please book early.